RIO DE JANEIRO (CNS) — If Blessed John Paul II had an actor’s mastery of the dramatic gesture and Pope Benedict XVI engaged the faithful most effectively through his learned and lucid writing, Pope Francis showed the world on his first international trip that his forte as a communicator is the simple, seemingly artless action that resonates powerfully in context. 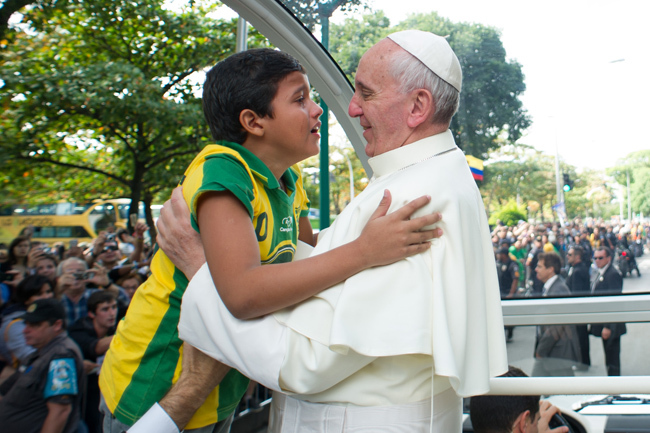 During his visit to Brazil July 22-28 Pope Francis said little that he had not already said more than once during his still-young pontificate. He repeated forceful calls for social justice, a more humble and empathetic church leadership and a more active and engaged laity. 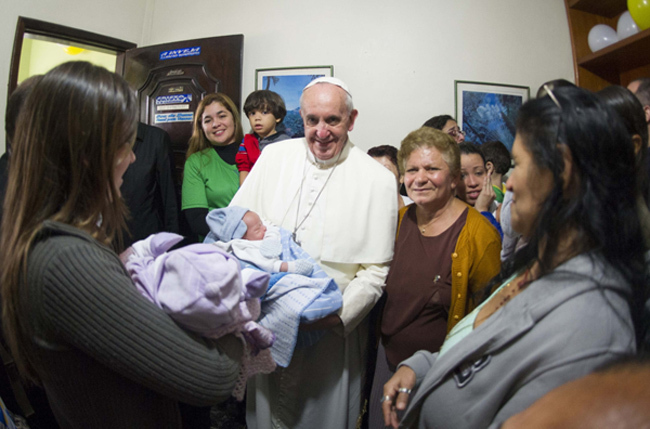 But given the historic nature of the occasion — the first Latin American pope returning to his native continent — he must have known that everything he said and did here would take on special significance, and he made extensive use of the setting. The display began even before he left Rome, when the pope was photographed carrying his own briefcase onto the plane, sending a characteristic message of humility: the menial work of carrying the bag was a task he reserved for himself. 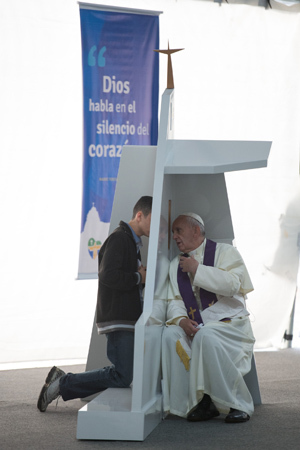 Pope Francis’ entrance into the city of Rio in a modest compact van instead of the usual large sedan — an image that instantly turned the Fiat Idea into a world-famous model — was an exhortation to simplicity for clergy and laypeople alike, consistent with his previous complaints about spending on luxuries in a world where children starve. It was during that ride that Pope Francis used his already famous gift for spontaneity to salvage what could have been a dispiriting mishap. The swarming of his car by pedestrians and the driver’s decision to enter rush-hour traffic, where the papal motorcade promptly got stuck, briefly seemed to augur only more chaos. Instead, the incident became a chance for the pope to display his almost magical rapport with crowds, when he was seen opening his window and greeting the very people that members of his security detail were frantically pushing away. 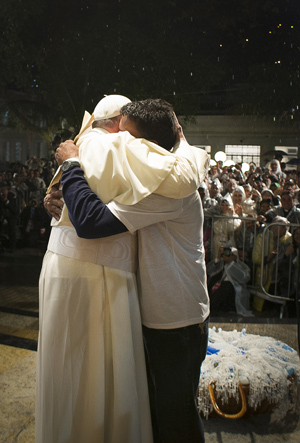 Images of Pope Francis’ visit to a Rio “favela” — his walk down the streets of shanties, and the tears in his eyes behind the altar of the slum’s little chapel — will surely leave more lasting impressions than anything he said there. Similarly, his speech to what the Vatican called the “ruling class of Brazil” — a gentle call to dialogue and “social humility” in a country shaken by massive anti-government protests — was clear and thoughtful, yet less eloquent than his embrace of a recovered drug abuser and former favela resident on the stage before the dignitaries. But he symbolically espoused the defense of unborn human life during the culminating Mass of World Youth Day, when he welcomed a married couple and their baby born with only part of her brain; they had chosen not to abort even though current Brazilian law would have permitted them to do so. The surprise inflight press conference was the pope’s final symbolic act of the trip, remarkable above all for the sheer fact that he did it and for the way that he carried it out. Known during his days as a cardinal for refusing interviews, he proved with a no-holds-barred exchange that, though he may usually be too busy for journalists, he certainly is not afraid of them. Having already charmed them on the flight from Rome by greeting each one personally, he then spent 80 minutes gamely answering their questions, following seven days of activity that had left all the reporters exhausted. In that way, the 76-year old pope also showed that, in the game of dealing with the press, he is well prepared to stay ahead.